Vsonics middle man.. The jack of all trades. Pros - Great fit, good cable, pleasant versatile sound signature. Cons - Straight jack, no strain relief on the cable. The housing has a rounder shape then the vsd3/5 and i much prefer it this way. While the shape and looks is simple, it does not feel very cheap. The diamond cut shape on the vsd3/5 seems a little bit gimmicky to me. The fit is very good and comfortable. Very negative fit so it does not stick out of my ears at all. The cable is also very good. It is thin, but feels sturdy enough. However i would like a angled jack like on the vsd1s and vc02 for example. They have the jack, why not put it here as well? Also the cable lacks strain reliefs, a common “problem” with v-sonic iems and probably one of the most common defect. The cable is NOT removable which i think is a good thing. The mmcx style connector they used on the vsd3 is horrible anyway. Bass is well balanced and kind of warm and smooth. However it is not very bloated or bleed into the mids. Plenty of heft for most ears i think. However, it is a rather balanced iem over all so if you want loads of bass.. This is not the iem for you. Mids is taking a step forward in the mix. Again, the character is still rather warm and easy to listen to. guitar riffs sound great with both crunch and detail. The overall vocal presentation is good. Not as good as my reference the TDK ie800 but it´s enjoyable. Compared to the vsd1s which it replaces. ( i think ) The vocal presentation is taking a step forward. My ears found that the vsd1s was a more recessed and brittle midrange then the vsd2. Now the hot topic when speaking of vsonic iems. The treble. Previous versions like the vsd1,3,5 has a forward treble. Now i do like treble and i have quite the tolerance for sibilance but the treble tend to be quite “hot” on vsonic iems and if you want something more smooth and less fatiguing the vsd2s is a great choice. It is toned down quite a bit compared to the vsd5 for example, but i don't feel that is it is lacking really. For long or easy listening sessions. It´s well balanced. And i find this a good change in the iems from vsonic. Overall i think it´s a very good all round iem with great fit, good cable and a easy likeable sound for most people. If you own the vsd3/5 i think this is a good iem to have to balance them both out. 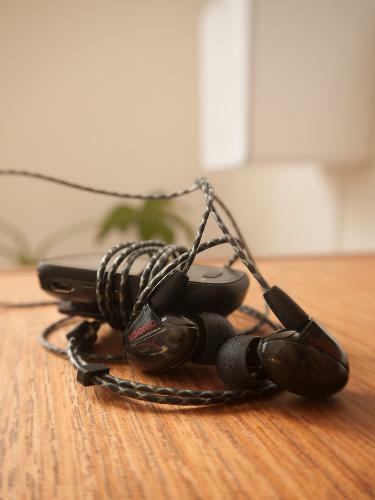 Another great argument to add another iem to the collection isn’t it ?